Cooking a turkey in the oven requires knowledge of how long to roast the bird for. The larger the turkey, the longer the bird needs to be in the oven to ensure it reaches the proper temperature. If a turkey is undercooked, especially one with stuffing inside that also needs to reach proper temperature, food-borne illnesses can be caused. Take caution and patience in preparation of a turkey and always make sure to use a meat thermometer to check both the meat of the turkey and the stuffing inside. Cooking a turkey thoroughly is important due to safety issues in consuming undercooked poultry. The key is knowing how many pounds your turkey weighs and the time needed to cook it completely with the method you have chosen to cook it. The rule of thumb is approximately 15 minutes for every pound of turkey. Whole Foods Market recommends adding five to seven minutes of cooking time per pound of turkey, if the turkey is stuffed. You can tell how large the turkey is either by looking at the weight on the package---most turkeys are sold at a price-per-pound---or by weighing the turkey on a meat scale. Once the weight is determined, you can determine how long to cook the turkey. According to the Food Safety and Inspection Service, turkey meat becomes safe to eat at 165 degrees. To reach this temperature, roast a stuffed turkey at 325 degrees. Cook an 8 to 12 lb. turkey for three to three and a half hours; cook a 12 to 14 lb. turkey for three and a half to four hours. A 14 to 18 lb. turkey, will be done in four to four and a quarter hours, an 18 to 20 lb. turkey will take four and a quarter to four and three-quarter hours and a 20 to 24 lb. stuffed turkey takes four and three-quarters to five and a quarter hours. Insert a food thermometer into the cavity of the turkey and into the stuffing and letting it sit for five minutes to check the internal temperature. If the temperature is not higher that 165 degrees, continue cooking the bird. Also check the temperatures of the thickest part of the breast, the wing, the leg and the thigh to verify temperature readings. Undercooked poultry, such as turkey, can cause food-borne illness. According to the University of Manitoba, undercooked poultry carries two dangerous bacteria types: salmonella and campylobacter. Both bacteria affect the gastrointestinal tract and can cause diarrhea, upset stomach and even fever and vomiting. 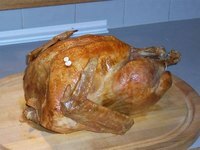 Stuffing inside a turkey can absorb these bacteria as the meat cooks around it, which is why it takes longer to cook a stuffed turkey and why it is important to verify that the stuffing has reached the appropriate temperature along with the bird around it. Benjamin Franklin suggested that the turkey be named the national bird of the United States of America. The heaviest turkey ever raised was 86 pounds. Henry VIII was the first English king to eat turkey and Edward VII ate it during Christmas.